Leona (?) married Allen Houghton. Dorthia Current married James McNary. Dorthia Current married Gival Leon Houghton, son of David Henry Houghton and Eva Ann Dole, Lelang D. Houghton: 1936. Gary Lee Houghton married Phyllis Jean Smoot. Gary Lee Houghton married Donna Hunt. 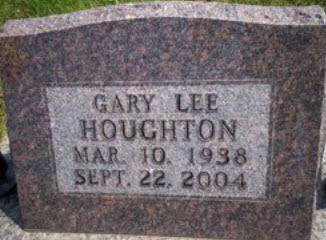 Gary Lee Houghton and Donna Hunt were divorced. Gary Lee Houghton married Pam Spiker. Nellie Dole married Gival Leon Houghton, son of David Henry Houghton and Eva Ann Dole, for 2 years. John Eldon Bausell married Marjorie Maxine Houghton, daughter of Gival Leon Houghton and Reta Mae Young. Everett Hyde married Marjorie Maxine Houghton, daughter of Gival Leon Houghton and Reta Mae Young. Angeline Vetter married Leland Devere Houghton, son of Gival Leon Houghton and Reta Mae Young, in Aug 2, 1994. Monica Guida married Richard Gerard Houghton, son of Leland Devere Houghton and Mary Zylstra. Neil Arthur Houghton married Paula Margaret Granville in Oct 17, 1980 at Melburne, Australia. Peggy Fox married Arthur Amory Houghton III, son of Arthur Amory Houghton Jr. and Ellen Crenshaw, in May 13, 2006 at Stevenson, MD, USA. Peggy Fox and Arthur Amory Houghton III were divorced on May 2, 2018. Arthur George Houghton married Dorothy June Hobba in Nov 28, 1953 at Melburne, Australia. George Arthur Houghton married Dulcie Myrtle Upton. William Robert Houghton married Mary Beardmore. John Houghton married Mary Correll in circa 1820 at St Andrews Presbyterian Church, Quebec City, Quebec, Canada. Mary Correll married John Houghton in circa 1820 at St Andrews Presbyterian Church, Quebec City, Quebec, Canada. Henrietta Marguerite Starbird married Everett Lunt. Everett Lunt married Henrietta Marguerite Starbird, daughter of Charles Frank Starbird and Kate Wentworth Houghton. Phillip Kingsland Houston married Margaret Houghton, daughter of Augustus Seymour Houghton and Caroline Labau Squier, in Oct 12, 1922 at New York, New York Co., NY, USA. Sherrill Houghton Houston married Mary Setchell.